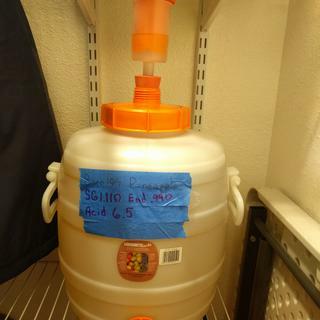 Speidel Plastic Fermenter - 20L / 5.3 gal. These heavy duty plastic tanks offer a fantastic fermentation & storage solution at a great price. Small footprint makes them easy to store - take better advantage of the space you have to dedicate to wine & beer making. 12L: Perfect for storing small lots, making experimental batches and taking some of your beer or wine along with you to your next party. 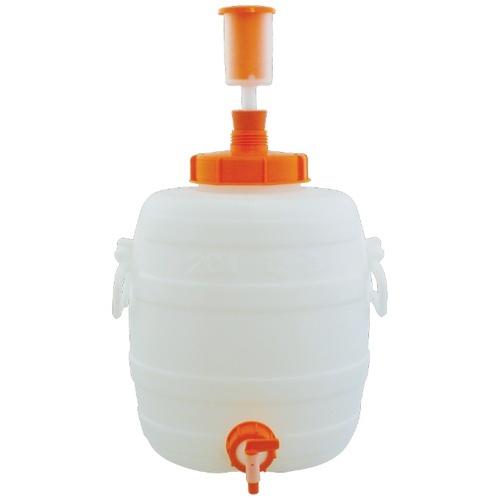 20L: Ideal for secondary fermentation and storage of 5 gallon batches. 30L: The vessel for fermenting wine kits and 5 gallon batches of beer with plenty of headspace and no need for a blowoff tube. 60L: Perfect for fermenting larger batches of wine or 10 gallon batches of beer in a single container! Only 4" larger in diameter than a 6.5 gallon carboy! 120L: Ferment & Store large batches of anything - your creativity is the only limit! Approximate Dimensions: 12 in. Diameter x 16.5 in. Height (w/out airlock in place). Mouth is 4.75 in. wide. Note - The maximum temperature that these plastic fermenters can handle is 140F. These fermenters are so easy to clean, lift, and store. We are slowly replacing our glass carboys with these. I have the 7 gal. Wanted the 5 gal. For my second racking of 5 gal. fermentation so I have no headspace. Getting back to into brewing, and want to simplify my process. Best plastic fermenter I've found. Great deal - love the fermenters! Sound like the best one. This will be my third Speidel fermenter. So much easier to use and clearn than a carboy. Secondary fermenting cask ale with no head space. I already own 1 and love it. Why not get two more? I was looking for an upgrade for my small batch brewing and this received a far amount of good reviews as well as a fair price. Trying a small home made batch of California wine grapes. Already own. Adding another. Useful for dry hopping. Size. Need a low profile secondary for lagering. Handles work with movement of the fermenter. Already own... adding to. These are awesome ! I'm hoping these will make great aging vessels for sour beers. No more broken glass carboys, easy clean, handles for lifting, I have 2 others and have been completely satisfied. Do the components ship wrapped so they don't damage the fermenter? BEST ANSWER: Hi Wesley - Our fulfillment team will do everything necessary to make sure that items do not arrive damaged. Speidel is hands-down the best fermenter on the planet. If you’re not going stainless steel conicals, go with Speidel. Easy to handle and clean, and it fits conveniently in my keezer. I use this size for secondary fermentation. The Spiedel fermenters are built pretty solid but I’m not a huge fan. These may work perfectly for you but I found a few issues and have already moved on to something different and am Craigslisting this thing. The main issues I had are: I upgraded to the expensive metal spigot and even though it was on tight and I checked it before filling it slow leaked overnight and made a little puddle of wort all over the floor, I tried multiple times to put it on again and tighten/adjust it and it is leaking from the center spigot seal, not the threaded seal so the metal spigot design isn’t that great for $30-35. I then dumped the beer into a basic plastic fermenting bucket to finish it since it was only 18 hours in. The next brew I used this on I used the plastic spigot it comes with since the metal upgrade was leaky, all went great during fermentation until racking time. The spigot does not fit standard 3/8 tubing or if it does maybe it has to be super hot and worked on roughly after boiling. This resulted in me racking the beer into the keg with a larger 1/2” tubing I had which was too big and loose and caused all kinds of air bubbles and leaked beer onto the floor, also I was unable to get 100% of the wort out of the spigot due to the way the cake settles and how wide these are, I lost like a 1/2 gallon I couldnt get out without bringing all the yeast and trub with it. Using an auto-siphon might be the best bet but these things are DEEP with a narrow mouth so it may be annoying to siphon as well. I’d say between the spigot flaws and the deep wide body spreading the wort out thinly over the trub I lost like a gallon of IPA. I may just be dumb and used to wide topped brew buckets but I hate this thing and immediately bought an Anvil stainless steel bucket fermenter after the last brew which will replace the old plastic buckets I’ve been using and the new Spiedel as well. I have a Spiedel for sale and also a Catalyst psuedo-conical fermenter(issues with that thing too) if anyone is interested haha. Lesson learned just spend the duckets on a stainless conical or stainless buckets if you plan on brewing seriously. I still give the Spidel 3 stars because it is a decent piece of equipment and will probably work great for most people and present few issues. For my style I personally hate it, had major issues during my process and it’s also expensive for plastic. Spend a little more on the Anvil stainless bucket fermenter or a Ss Brew bucket and it’s definitely worth the $$$. I have 3 of these and love them. I run two 5 G cider batches at a time and just rotate them from primary to secondary and around and around. I rarely use the spout when moving from primary to secondary b/c the yeast bed always seems to be just at that level. No big deal I just siphon it. They are easy to clean and sanitize but boy that cider smell never comes out. Mmmmmm. I have had no issues with jagged plastic edges in upper lid (I.e. when cleaning them) or leaky spouts at all. 5gallon is perfect size and handles are strong enough I can move these around and shake the carboy up with them. These do me well till I move up to stainless. Very pleased. Easy to handle and move around. It certainly won't shatter. The spigot is preferred over using a siphon. I'd been considering pumps, but with this fermenter & spigot, no longer need a pump. Just wish I could get this style lid on the 2.5 gallon size. I prefer smaller batch sizes. I have 2 of the 2.5 gallon but customizing the lids for an airlock didn't go too well. I am very old and they are easier for me to handle, I have 3 now. Great secondary for 5 gl batches. have (2) 7.9gals and needed one for smaller batches - the 5.3gal fits the bill. Tough thick plastic won't break and shouldn't let much oxygen through. The handles, large top opening, and spigot are big improvements over glass demijohns. The downside is not being able to visually observe the fermentation without opening the lid. Have you ever broken a glass carboy? Aren't glass carboys are a pain to clean? Glass carboys have a place, but essentially switched over to Speidel fermenters. I don't use it as a primary fementer, but it is my secondary fementer and storage vessel. You can use it as a primary fementer, but you have less then 5 gallons of wine. I set up my primary fermenter for over 5 gallons of win and when I rack off of the lees, I have over 5 gallons. Extra goes in a smaller container. Everyone worries about oxygen, so I apply a blanket of CO2 to prevent oxidation. The picture is of a 5 gallon vessel with an experimental batch of pineapple wine I'm experimenting with. I've a little over 15 gallons of peach wine in the 15 gallon fementer. I would highly recommend these fermenters over glass carboys. Easy to clean and light weight. I have a total of 7 of these fermenters now. I have two 15 gallon that I use for hard cider. I have three 7.9 gallon ones I use for beer and three 5.3 gallon ones I use for wine. The three I use for wine have no staining or odor after months of aging. Easy to fill and clean. I have totally gotten away from glass carboys now. Love it, but love hurts!! Love my 20L, but it tries to cut me when cleaning sometimes!! So far, this is my favorite fermenter. Very easy to clean and high quality materials. I have limited space and time for brewing, bottling, and cleaning and am constantly looking for ways to consolidate all off my brewing kit into as few pieces with ease of cleaning and use. The 20L fermenter fits my needs nicely and is easy to move, clean, and store. I recently used my plastic carboy and it easily took double the time to clean versus the Speidel. Niceties and/or improvements would include a smaller airlock and the spigot to be closer to the carboy body (simply for limited space and reckless kids) as well as increase volume to 6 gallons (the krausen always hits the top). I plan on buying two more and then selling off my carboys and associated accoutrements. Great product. Easy to clean for the most part. It has some very rough textured plastic on the rim (inside the fermenter). I am concerned with things growing there that I do not want. I do think it is a bit over-priced, but it is easy to handle and move around the house. I really love this thing, it's easy to clean, light, and the handles are honestly well balanced when full you van pick it up without disturbing it pretty easily. As others have said this is definitely a step up from glass carboys it needs some finishing touches, & Speidel could do better. Personally I use mine as a secondary when I'm doing a lot of dry hops or spices due to the large lid, but the airlock is annoying and way too large for my needs. Buy a rubber stopper that fits a normal airlock. The spigot isn't bad, but it's not great either. you can take it completely apart which is nice, but I'll admit where it's not leaking yet I think it's starting to get worn. A SS one is on the list. So, that being said I highly reccomend these. I just hope their R&D keeps working on them, these could be the standard. I have one 20L and plan on getting another to play with. I have zero complaints about the Speidel line of fermenters. Easy to clean, non-staining, won't break and cut you! This is the second Speidel I have bought. This size is perfect as a fermenter for small batches or as a secondary or bottling bucket for 5 gallon batches. Lightweight, easy to clean, don't leak... What's not to like? So easy to clean and use. These are the best! I was amazed at the level of thought put into the design of this product. It is basically a homebrewing/winemaking targeted carboy, just like the Nalgene carboy you will find in chemistry labs. The bigger plus is that it comes with plenty of accessories. There are 2 things I didn't care much about. 1, the fact that the airlock is about 2-3 times the size of a regular one, but that's not necessarily bad, unless you use a mini fridge like me. 2, the inner finish of the top neck is not the best, they should put a little bit more care into it to make it smoother as it is pretty porous. These are great to use. Easy to clean, and move beer into and out of. Great fermenter, will buy more!!! I was never a big fan of plastic. Speidel changed that. Racking to the secondary was too easy. And so was cleanup. No carboy soaking. Overall I saved time and work. Now all I need is more Speidel fermenters. I see no advantage (except that it's cute) over a plastic bucket fermenter, at more than twice the cost. I now own 14 of these Spiedel plastic tanks in various sizes (20, 30 and 60 liters) and will probably buy more for wine making and storage. HOWEVER, these tanks are far from perfectI suspect that everyone?s enthusiasm for them arises mostly from their superiority over carboys. My main complaint is the very sharp edges around the top opening, which have caused me painful hand cuts during punchdown and washing/sanitizing. Knife-like manufacturing defects (mold squeeze-outs) are not taken off at the factory and, beyond this, the design of the top edge of the vessel mouth results in a sharp edge on the outside of the mouth. One must be very careful removing this as there is hardly any material there on which to seat the cover gasket. (The best method I?ve found so far is to use a very sharp chisel with my thumb on the inside of the mouth and lightly shave off the edge.) The mouth should be redesigned with more substance and 90-degree, slightly relieved edge. The valve at the bottom is also a problem. It clogs up quite easily, which makes it useless for racking off the gross lees. In theory, one could put a screen of some kind behind the valve but there is no accommodation in the molding to insert such a thing and mucking around down there will only disturb the lees that one is trying to keep on the bottom. The valve itself seems rinky-dink and prone to contamination (there is, for example, a tiny air hole in the outside of the assembly). Why not include a serious bulkhead that one could tap into to install more professional kinds of valve? And an inlet for gassing higher up on the side? And more stable spots on the bottom on which to rest racking canes? In sum, these Spiedel plastic tanks are a big improvement over the old carboys, but there is still an unsatisfied market for more serious HDPE tanks in small sizes. INSIDE ROUGHNESS Inside the 5 inch mouth and just under the threaded diameter is considerable roughness that can be felt by hand but not seen. This roughness would be nearly impossible to clean. I assume this was created not by the blow molding process but by tooling used to hold the vessel while performing perhaps the handle mount assembly. I was told this roughness appears on the three sizes with handles but not the smallest 13L which doesn't have handles. THE SPIGOT is stiff to operate and the spout portion that tubing would be attached to rotates as the handle is rotated. Overall, the spigot should be higher quality or there should be an option for the user to install his own spigot. I bought a $4 spigot that operates very smoothly (o'rings inside?) and has a barbed spout that doesn't rotate when the handle is turned to ON or OFF. i ordered this size as a primary fermenter. well i went back and order the 7.9 gallon one now. will use this one as a secondary fermenter. cleans easily, the handles are strong and it is light weight. you don't realize how heavy 5 gallons is until you pick it up. Great fermenter. Worth the wait and the cost. I purchased two 20L Speidel fermenters primarily because I liked the design including handles, draining spigot and wide top opening for cleaning ease. Additionally, the oversized airlock doesn't clog with double pitching and I have experienced no blow-offs. So much easier than a carboy. I am ordering a third this week. Can't beat the price for a large fermenter. Easy to clean to. No reason to use glass as it'll end up breaking if you're not careful, and unless you're harvesting your yeast there's no reason to get a conical. Love it! Well worth the extra cost over glass/plastic carboys. I have two 20L size that I use for secondary fermentation after conical primary. Much easier to handle and clean than carboys. Saves a lot of time. I liked my 30L so much that I came back and bought 2 more only the 20L version. I like the large opening for easy cleaning. Of course you have to use a sponge to make sure that you do not scratch it. I am now using these for all my ales and carboys for all my lagers. Which I might add these weight much less and they dont shatter. Not quite a conical but I like it more then my carboys and buckets. I have used this tank as a secondary now for several batches. It is lightweight and easy to clean. With the wide mouth, i can easily discard leaf hops after dry hopping. Great option for dry hopping instead of 5 gallon glass carboy, which is not exactly easy to remove hops from after dry hopping. Sturdy little fermenter that will not break if you drop it. Having fermented in both plastic and glass, I cannot taste any difference. The wide opening at the top makes it a snap to clean (much easier than glass carboy). Compact size is also just great to have, fits my adapted freezer well. Easy to lift with the attached handles. I like this fermenter actually better than my glass carboy.